A few people have remarked on how down I’ve been lately, and it’s true. When I’m down, I tend to over-think things more than usual, so very basic topics like what I should make for dinner become these drawn-out, hours-long searches for a recipe that sounds good and is logistically possible with the tools on hand and accessible ingredients. 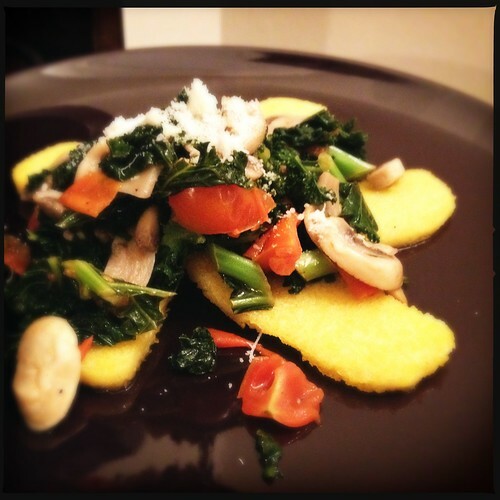 Yesterday I just said “screw it” and chose the first recipe that looked not-horrible: kale, mushroom, and tomato sauté with polenta. It worked. Saying “screw it” — I should do this more often. Torgi’s renewed vigour. We’ve stepped up his insulin dosage and he is acting more like his old self. Working ahead in one of my courses so I can focus on the exam in the other one.